Did you ever think that Tyrese Rice would be that kind of player that can collect a Euroleague championship PLUS a Final Four MVP Trophy? I didn’t, I admit. Also, I was pretty sure that Real Madrid would win the final on Sunday night, wondering how the Israeli side could even try to get close to Sergio Rodriguez and his teammates. I was wrong, and I have no problem in saying that. Now, just a couple of samples to discuss one point. Tyrese Rice was a killer during the playoffs series against EA7 Emporio Armani Milan, he did it again in the Final Four. His layup that gave his team the victory in the semifinal against CSKA Moscow already was a play for the ages, due to the very particular moment of the game (and, I would say, in the history of both teams). So, will Tyrese Rice be the player that everybody will try to sign in the offseason? Can he fit in any system with the same impact? Can he be the guy who runs a team all game long (all season long) or does he need to keep is current role of troublemaker coming off the bench (and then stay on the court to rely on is instinct)? How can you coach his instinct? In this play, Rice runs a pick and roll with Alex Tyus: the point guard recognizes how the defense react. In this situation, Real Madrid center’s Ioannis Bourousis doesn’t want to let Tyus get enough space for an alley-oop dunk, maybe the trademark play of the Rice-Tyus duo. That’s why he didn’t switched on the pick and roll, but that gave to Rice the opportunity to go for a downtown shot. Can you criticize this choice? Sure, you can. Even knowing that Tyrese Rice is not a pure shooter. But in basketball all your choices can be right or wrong. The point is: the offense has the key. “Every time an offensive player has an advantage over the defense, so the most important thing for me is to not do the same thing all the time. Sometimes you need to change your rhythm, sometimes you need to change your direction, sometimes you need to change the side of the pick-and-roll. Everything is in how you read the defense”. That what Olympiacos’ king Vassilis Spanoulis told me last year. “Read the defense”. Has Rice learned that lesson? 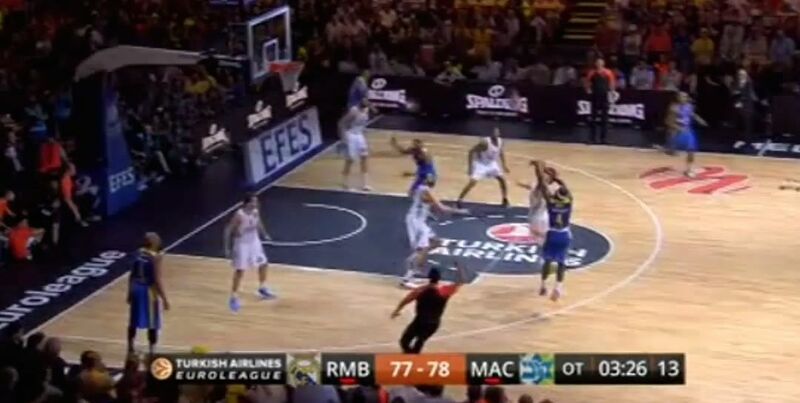 In the second picture, we have the following offensive possession of Maccabi Electra: same play, same situation. Pick and roll between Alex Tyus and Tyrese Rice. Same positions, a different reaction from the defender. 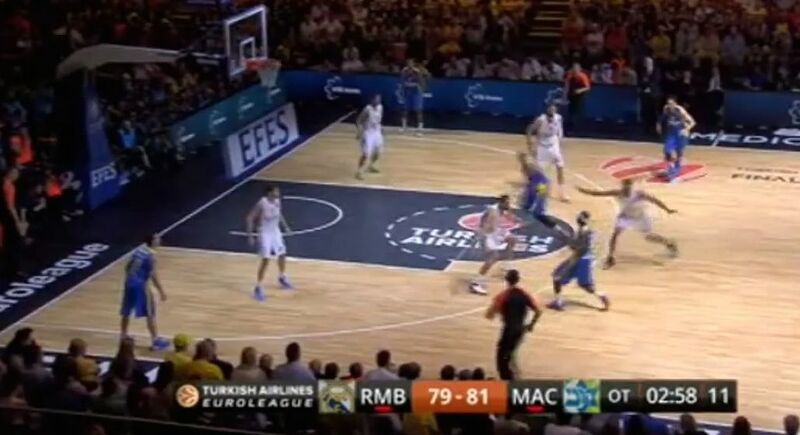 This time, Bourousis comes closer to Rice as Maccabi Electra’s point guard knocked down a three-pointer before. And Rice read the defense: no reason to force a “three” in front of a seven-footer, let Tyus fly with an alley-oop pass, as Bourousis defensive choice cleared all the space on the lane. Spanoulis was right in his sentence, and Rice proved it again. All you need to do is read the defense: yes, sure. But how many players can keep their focus to do it in a Euroleague final overtime? Now, you’re a coach and you need a point guard to win the Euroleague: will Tyrese Rice be your man? And what will you ask him? Can he play better than he did? Would you bet on coaching his instinct and forcing him to play a different system? Sometimes players and coaches’ careers (and teams’ destinies) depends on the answer to that kind of questions. And, to be honest, you need some luck to make the right decision.